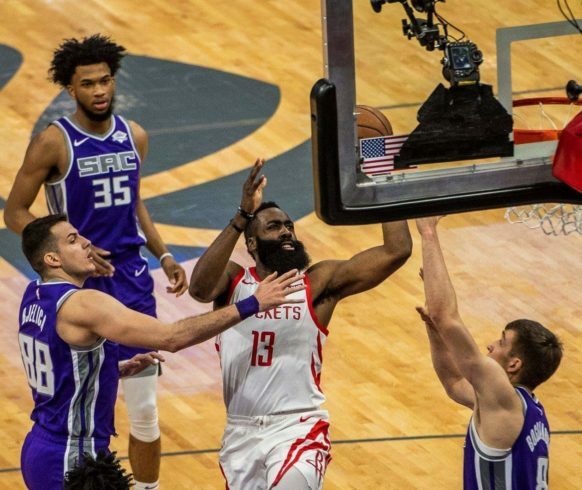 (SACRAMENTO) — A whirlwind of trades went down on Wednesday night and the Sacramento Kings were smack dab in the middle of them. And yes, the acquisitions are beneficial for a team that hasn’t made the NBA playoffs since 2006. The Kings finally landed a much-needed small forward in the process. Sacramento traded second-year player Justin Jackson and veteran Zac Randolph to the Dallas Mavericks for Harrison Barnes. Complete with a championship ring from his playing days with the Golden State Warriors, Barnes was averaging almost 18 points, 4.3 rebounds, and 1.3 assists per game for the Mavericks this season. He is adjustable to play both forward positions. Iman Shumpert is also essentially done playing for the Sacramento Kings and is part of a three-team trade that includes the Houston Rockets and Cleveland Cavaliers. Alec Burks is head to Sacramento from Clevland and the Cavs will receive Brandon Knights and Sacramento native Marquese Chriss from Houston and a protected first-round pick. Shumpert is headed to Houston. The Kings (28-26) and the Rockets had a tango at Golden 1 Center while the trade process was underway. Houston ran away with the victory, beating the Kings 127-101. James Harden had 36 points and six rebounds, including eight 3-point baskets. The Rockets snapped the Kings seven-game win streak at G1C. Houston (32-22) will get a proven, much needed, defensive player in 27-year-old Shumpert. Shumpert was the glue in the locker room and one of the reasons why the Kings turned things around this season in a positive way for the organization. The young players are going to miss his presence for sure. Randolph, who had not played in a one-single game this season for the Kings was on the backend of a two-year, $24 million contract while Shumpert was in the last year of a contract that pays $11 million this season. Burks, packing his bags for the second time this season, was traded from the Utah Jazz to Cleveland for Kyle Kover in November. OBSERVER video footage by Russell Stiger Jr.